I had one of those rare impromptu weekends that ended up being really lovely. My mother gatecrashed on Friday night and we ploughed our way through several bottles of wine, then the next day a seemingly innocent stop off at a lighting shop turned into a full-blown girly shopping day. A detour into food shops around lunchtime left us with some gorgeous whole sea bass. While lunch itself was a delicious salad affair, dinner was altogether more special. I briefly headed out to Primrose Hill for a friend's birthday, and left my mother in charge of the kitchen. Returning home to the dish below was really quite a treat. Make sure your sea bass is descaled and gutted when you buy it - I had to fillet my own fish fairly recently and it was not a pleasant task. I realise this makes me sound very princess-y, but as far as experiences go, it's one I'm glad I've done but one I equally have little desire to repeat. Some things are best left to the experts! Preheat the oven to 180°C, then lay out on a flat surface about 40cm tin foil. 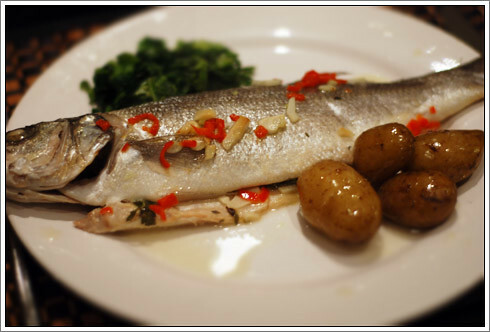 Line the tin foil with baking paper, then place a sea bass in the middle of the sheet. Put a few sprigs of thyme in the belly cavity, then peel and roughly chop the garlic and chillis. Add a little of the garlic and chillis to the belly cavity, then arrange the rest on and around the fish. Sprinkle with a little sea salt, lift the foil at the edges to prevent any lliquid draining out and add a quarter of the white wine, olive oil and lemon juice. Encase the fish in the foil so it is sealed tightly but not clinging to the fish so it can steam. Place on a baking tray and repeat for the remaining three fishes. Bake for 30 minutes, then carefully undo the foil bag and transfer the fish to a warmed plate. Serve with a wedge of lemon, some new potatoes and something green - we went for delicious buttery spring greens. Heavenly! Thanks to my mum for doing all the cooking too - things always taste better when someone else does all the hard work.